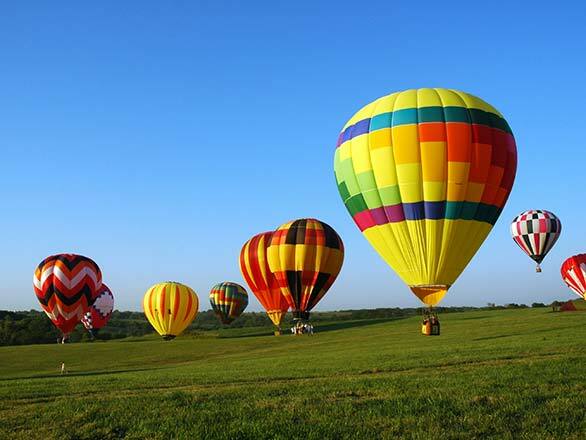 Fly High Over Napa On A Calistoga Hot Air Balloon If you’re seeking an uncommon excursion in stunning Napa Valley, set out at sunrise for a high-altitude adventure like no other. Watch as your flight crew inflates your hot air balloon surrounded by the gilded rays of early morning sunlight. Then step aboard, relax and enjoy the views as you climb up 2,000 feet above the rolling hillsides, distinctive appellations and lush vineyards of California’s famous wine country. Once you reach altitude, you’ll enjoy expansive views of Napa’s famous landmarks, including Castillo di Amorosa, Palisade Cliffs, Mount St. Helena, Chateau Montelena, and Old Faithful Geyser. Delight in a breathtaking 3- or 4-hour flight above the Napa Valley. Enhance your experience with a Champagne breakfast or brunch. Make a day of it with a post-flight wine tasting tour, horseback ride or biking excursion. Plan A Relaxing Getaway To Charming Calistoga From unparalleled wineries to luxury spas and world-class dining, Napa Valley beckons visitors to discover its delights every season of the year. Whether you’re planning a relaxing weekend break or a romantic couple’s escape, Calistoga Spa Hot Springs is the ultimate destination for a wine country getaway. Unwind in contemporary rooms surrounded by the beauty of Napa Valley and discover the many nearby things to do in Calistoga. Call today and book your Napa escape at Calistoga Spa Hot Springs.